Treasury holdings as a political weapon? The US Navy confronts the PLAN (People's Liberation Army Navy) in the South China Sea. Someone miscalculates and shooting starts and the situation escalates wildly. Eventually, there are three American carrier task forces, accompanied by submarines, along with the fleets of Asian allies like the Philippines, Japan, Australia and so on, in the area. Just as PLAN forces are outnumbered and the Chinese tactical situation look hopeless, the PBoC picks up the phone to New York, "I have $1 trillion in Treasury assets to sell - now." The theory is, some Americans may be patriotic willing to die for their country, but how many would be willing to lose their homes for their country? How about losing their jobs for their country? Is this the plot for a twisted Tom Clancy novel? Bearish Apocalyptic fantasy? How plausible is this scenario? What happens if the Fed gets less dovish? Mid-week market update: There doesn't seem to be much of a point in writing about the technical condition of the market when its likely path is dominated by a binary event like the FOMC meeting this week. So I thought that I would write about how to interpret and react to the FOMC statement instead. Much of investing is about setting a course of action and assessing risks under different scenarios. A key assumptions of my equity bull case that I made on the weekend is a relatively equity friendly Federal Reserve (see How the SP 500 can get to 2400 this year). As we approach another FOMC meeting, a key question is, "How do we react if the Fed gets more hawkish?" Poised for a hawkish rebound? Despite the dovish tilt of the Yellen Fed, BCA Research pointed out that the Fed seems to go through a stop-start hawk-dove policy loop - and we are currently nearing a dovish extreme.A reversion to a more hawkish tone in its communications would therefore be no big surprise. From a technical perspective, the markets are also ripe for a reversal. The USD Index, which is a key indicator of monetary policy divergence and driver of US corporate earnings growth, is currently testing an important support level. Hedge funds have reversed out of their crowded long in the USD and they are now slightly short. A less dovish message from the Fed this week has the potential to embolden dollar bulls and panic commodity bears. The (inflation) universe seems to be unfolding as it should. Regular readers know that I have been preparing for a resurgence in commodity prices (see The 2016 macro surprise that no one talks about, written in December 2015, RIP Correction. Reflationary resurrection next? written in March 2016 and My roadmap for 2016 and beyond, written a week ago). We finally got broad based confirmation of a recovery in commodity inflation last week. Commodity and oil prices shrugged off the Doha non-freeze surprise and broke out to new recovery highs, which is bullish as you can tell the tone of a market by how it reacts to what should have been bad news. As the chart below shows, the cyclically sensitive industrial metals staged upside breakouts above its 200 day moving average (dma), as well as new recovery highs. 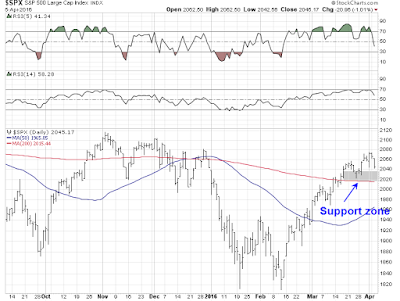 The energy heavy CRB Index did break out to the upside, but it is now testing its 200 dma. Mid-week market update: I was wrong. I thought that the stock market was due for a pause and pullback last week (see A possible pause in the uptrend). Instead, it has strengthening on skeptical sentiment and improving breadth. The combination of these conditions are suggestive that the current rally as a lot further to go in the short run. Each of the policy options I have discussed so far involves the Fed's acting on its own...A money-financed tax cut is essentially equivalent to Milton Friedman's famous "helicopter drop" of money. In more prosaic and realistic terms, a “helicopter drop” of money is an expansionary fiscal policy—an increase in public spending or a tax cut—financed by a permanent increase in the money stock. To get away from the fanciful imagery, for the rest of this post I will call such a policy a Money-Financed Fiscal Program, or MFFP. Consider the Bernanke helicopter money prescription. The government spends by borrowing and the central finances the spending by buying up the debt and printing money. It sounds positively Japanese. Abenomics, anyone? There has been a number of new subscribers who have come onto the site and I thought that it would be useful for me to review my outlook for the remainder of 2016 and into early 2017. I would characterize it as a roadmap, rather than a forecast, as there are far too many moving parts for this to be an actual forecast. My base case scenario calls for the US equity market to form a cyclical top in 2016. The market is likely to rise and make marginal new highs this year, led by late cycle sectors such as capital goods and resource extraction. As inflationary pressures become evident, the Fed will respond with a series of rate hikes, which have the potential to push the American economy into recession. With European growth still fragile and Chinese growth decelerating and beset by a debt overhang, such Fed actions could drag there rest of the world into recession as well. Risky assets such as stocks would not behave well in such an environment and a major downleg in stock prices is well within the realm of possibility. 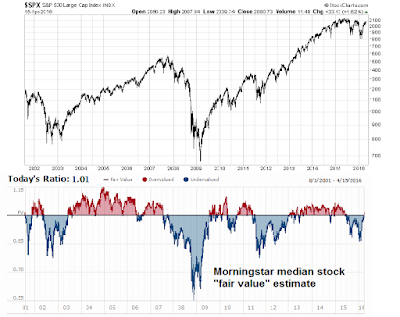 An analysis based on the Morningstar median stock fair value estimate, which shows the market to be trading at about fair value, is consistent with my roadmap. On one hand, the lack of gross under-valuation is unlikely to see stock prices rally significantly for the rest of this year. On the other hand, past history has shown that the market has been able to advance even under adverse conditions of over-valuation. Therefore a scenario of modest market gains, followed by a loss of macro momentum from changes in Fed policy, is well within the realm of possibility. The latest Chinese GDP release came in right in line with expectations at 6.7%, but the growth came at a cost. I had written about this problem in my previous post, Big Trouble with 5-year China?). The Chinese authorities appear to be up to their old tricks again of using credit to drive growth, which is a worrisome sign. The markets had been signaling this shift in policy for several months. My New China-Old China pairs had been rolling over in favor of Old China, where "New China" is represented by stocks exposed to the Chinese consumer and "Old China" is represented by financial stocks. Revealed: Why gold stocks have lagged gold, even as bullion rallied. Free report here. This is purely a tactical trading call with a time horizon of 1-2 weeks. How worried should investors be about insider selling? A reader raised a question after my generally bullish weekend post (see Equities in a macro sweet spot). The latest report from Barron's of insider activity had shown that readings had risen up into sell signal territory. How worried should investors be about this development? Insiders tend not to be short-term traders and they have long time horizons. The issue of capital gains vs. short-term trading gains are always on their minds, which means that their holding period is at least one year. If they sell, they have to worry the wash sale rule. So should you react to a single data point of insider activity? The earnings recession is over! If Parker had read my commentary last weekend, he would have understood the bull case (see Profit by thinking like Big Money). To put it very simply, the bull case for stocks can be summarized in two words: “Growth surprise”. Subsequent to that post, the market seems to be starting to wake up to the growth surprise possibility. Today, most of the hand wringing about an imminent recession is gone as stock markets around the world have surged from their February lows. Nevertheless, I am still seeing widespread signs of investor skepticism, which represents potential buying power that can propel stock prices to new highs as growth recovers. In case you missed it, you can get my free report on my uncanny short-term stock market bottom spotting technique that showed an 87% since 2010 by clicking on this link. How vulnerable is the market to dwindling buybacks? After I wrote my last post about the GAAP gap, which addressed many of the concerns about shortfalls in earnings quality (see The GAAP gap as Rorschbach test), I had a number of discussions about the vulnerability of the stock market to buyback activity. I had been meaning to write more on this topic, but Cullen Roche and Ben Carlson both beat me to it with some balanced perspectives on fundamentals behind buybacks. Nevertheless, here is my two-cents on the topic. The concerns about buybacks gained prominence from a post from Josh Brown, who highlighted analysts from HSBC showing that buybacks accounted for much of the equity demand since 2008. As the market enters a buyback blackout period during Earnings Season, could the stock prices weaken as this key demand slackens? Despite the above chart, the relationship between buybacks and equity returns is tenuous at best. Let me explain why. How far can this pullback go? Mid-week technical update: In my weekend market commentary, I wrote that I was intermediate term bullish on equities (see The trend is your friend (breadth, seasonality and sentiment too)). However, my inner trader was tactically watching the relative performance of the cyclical sectors for signs of market weakness. Now that cyclical stocks have weakened and, in particular, oil prices seem to be rolling over, the key question is how much further can the current pullback go? 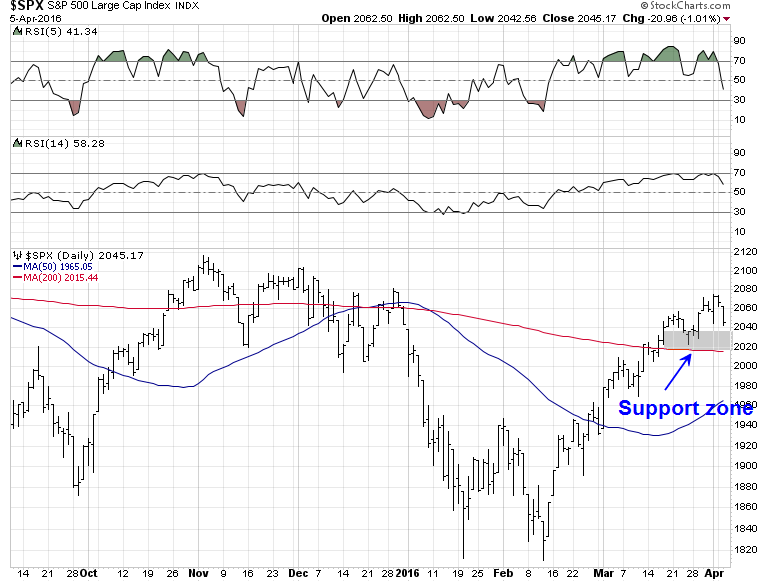 An examination of the daily SPX chart shows that it closed about 1% above a key support zone, bounded at the upper end at about 2040 and the lower end at the 200 day moving average (dma) at 2015. RSI-5 (top panel) flashed a short-term sell signal, but readings are not oversold yet indicating further downside potential. Will the decline stop at 2015-2040 or is this the start of a deeper correction? 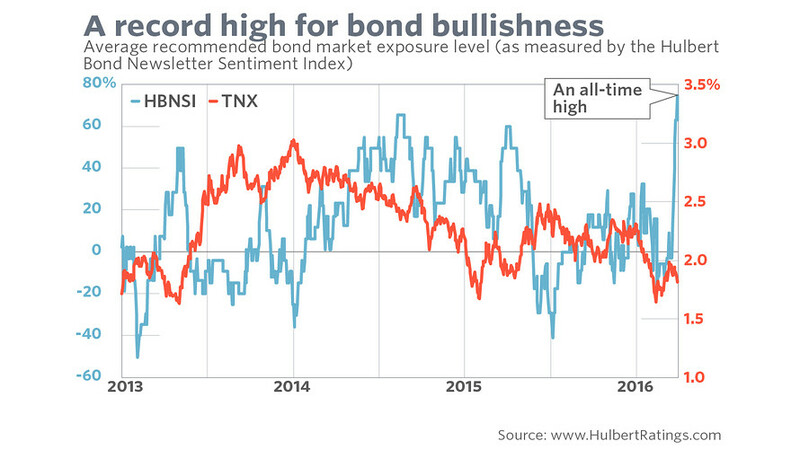 What does the crowded long position in bonds mean for stocks? I encountered a couple of interesting observations about the bond market on the weekend. First, Tom McClellan pointed out that the latest Commitment of Traders report on bond futures shows that the commercial hedgers, who are thought to be the "smart money" are massively short the bond market. 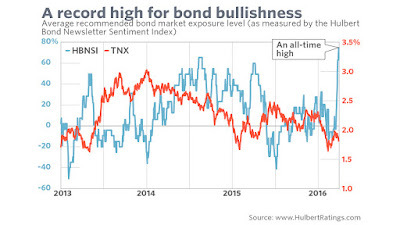 As well, Mark Hulbert observed that bond market timers are showing an off-the-charts level of bullishness on bonds, which is contrarian bearish. Right, the bond market is cruisin' for a bruisin'. Since the main focus in these pages is on the stock market, the BIG QUESTION for equity investors: "What would a weak bond market mean for the stock market?" My trading model turned bullish on stocks on February 28, 2016 (see the above chart of out-of-sample trading model signals and The market bottom 2-step: 1 forward, 1 back). 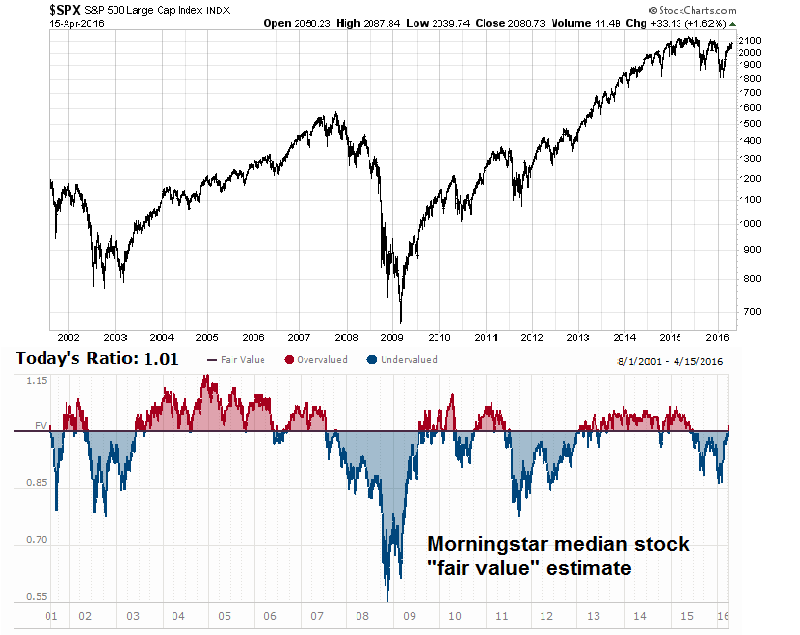 Since then, the stock market has been rising and I see few reasons for investors to deviate from a bullish position. The Trend Model analyzes global stock markets and commodity prices to see how risk appetite is evolving. This week, I take my readers for a tour around the world to show how risk appetite is improving. In addition, I find that improving breadth, positive seasonality and skepticism about the rally are also supportive of further market gains.